I didn't put quantities on the list because as you can see I made 5 trees, so everything will depend on how many trees you are going to make. 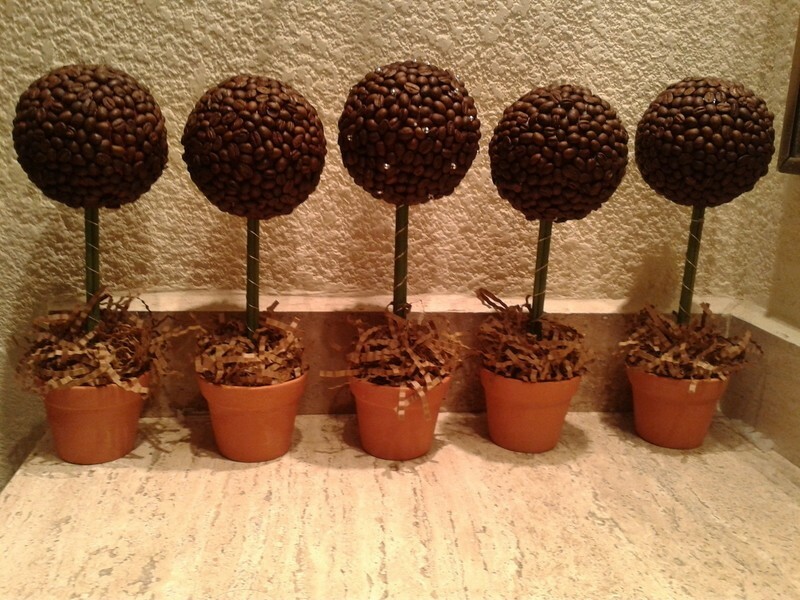 I hope you enjoy the tutorial and making these trees as much as I did. First of all gather all your material. 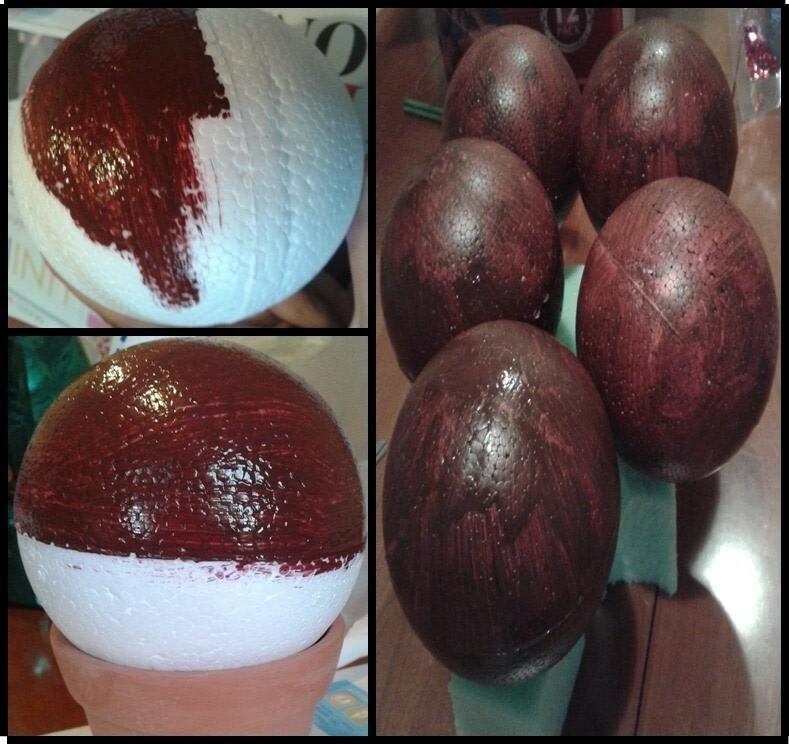 Start by painting the Styrofoam balls brown and this is where the toothpicks would come in handy cause you can either wait for one half to dry and then do the other half. 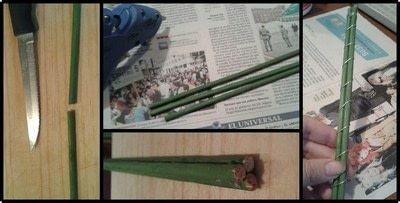 Now the sticks, I used 3 per tree, also mine were really long sticks and i didn't want my trees to be too tall, so i cut them 23cm (11.5 in) long (it doesn't matter if the tips look kind of messy cause no one will ever see that again), then with the hot glue gun i put a dab of hot glue at the top and bottom of the sticks and piled them up as to make a triangle. 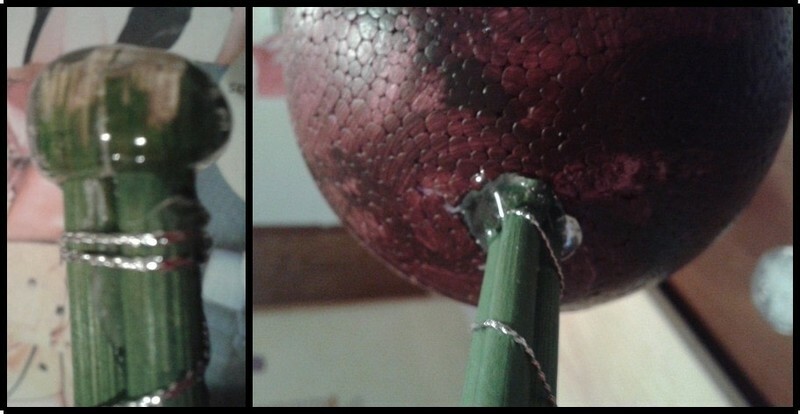 When they were nice and firm i wrapped my decorative thread around them securing it wit a dab of hot glue. 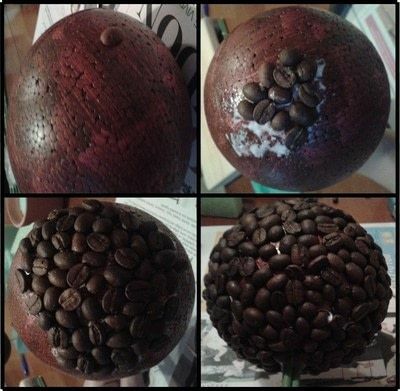 start gluing the coffee beans onto the balls, start from the top of the ball and work your way around and down, paste the beans flat side up and flat side down, alternating frequently, try not to leave too many empty spaces. I used white glue because it doesn't dull the smell of the coffee. This step can be really frustrating, but with some work and practice it'll be really easy. Once the beans are in place, and dry you can randomly glue the beads if you want to. 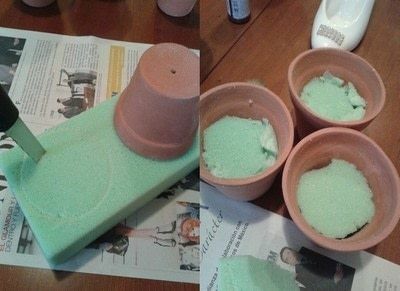 And then to put it in the flower pot, just like in step 5 you need to put a lot of hot glue on the sticks and just push it in the foam until the bottom, and then fill the hole up with hot glue. 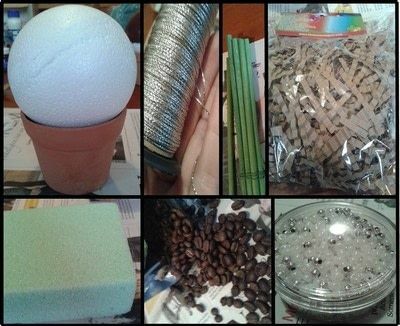 Now put some hot glue on the foam's surface and start gluing your shredded paper and arrange in a way that you like, put some more hot glue in different places until it is all secure. The topiary tree with beads is the one in the middle, i didn't do anything to the flowerpots but you can make them look prettier with some ribbon or paint them with stencils or anything else. Also you can make these with popcorn, marshmallows and any other things you can fit on a sphere.